The continued sinking of some parts of Mexico City in response to the over-extraction of water from underground aquifers, and consequent shrinking of the subsoil, has resulted in dozens of cracks in recent years. As noted in a previous post – Why are some parts of Mexico City sinking into the old lakebed? – some buildings in Mexico City have dropped more than seven meters (23 ft) since 1891. According to Gabriel Auvinet Guichard, a researcher at the Engineering Institute of the National University (UNAM), cracks are becoming increasingly frequent. The largest cracks are up to 22 meters (72 feet) deep and 30 meters long. The cracks damage buildings and infrastructure (especially roads and water pipes), and have alarmed residents in some areas in the city. Auvinet’s team at UNAM’s Geoinformatics Laboratory is compiling a database of all known cracks. They plan to produce maps showing the incidence, location and origin of the cracks to help construction companies meet building regulations. The database has records of 380 fissures at present, but is still far from complete. Some areas in the Valley of Mexico are much more prone to the earth movements leading to cracks than others. 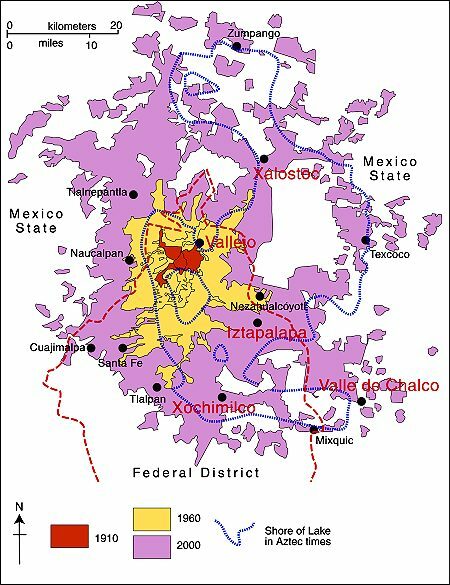 The areas with a high incidence of cracks include Iztapalapa, Chalco, Xochimilco, Xalostoc and Vallejo (see map). Chapter 23 of Geo-Mexico: the geography and dynamics of modern Mexico looks at urban issues, problems and trends. To preview more parts of the book, click here and use amazon.com’s “Look Inside” feature.